Volotea promotion sale 2019 - flights from €1 one way! Fly from many European countries to Conakry, Guinea from just €202 or £276! Laudamotion €5 flight credit per person for each flight you book today! In case of booking please visit Volotea website here (Members of Supervolotea) or one-way flights open for everyone from €1. Seats at each route are limited so hurry up with your booking of there is an offer of your interest..Volotea has been established by former Vueling founders and comenced operations in 2012. This Volotea promotional sale is valid for flights in travel period between March and June 2019. (Also vary by each of newly introduced routes). Book this Volotea promotion by 31st of March. In some cases the flights are also available over summer holidays! 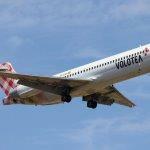 You can enjoy this Volotea discount when making your purchase by 5th of September. Booking sample using Volotea promotion 2019 below. In this case its for roundtrip flight for just €1. Various routings are availavle within Volotea network so many European trvellers may benefit from this latest Volotea promotion sale 2019..